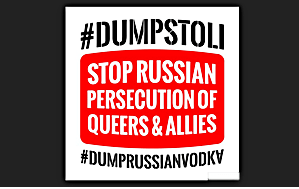 In reporting on the ongoing Dump Stoli Boycott that’s happening around the world in the past we have mentioned that Stolichnaya sponsors the LGBT websites Queerty and GayCities, both of which have not cancelled their sponsorship deals in light of the current atrocities being put forth on the Russian LGBT community. Today many LGBT journalist and bloggers received this email in their inbox. In lieu of the national Stoli boycott by some in the LGBT community, GayCities has convinced SPI (Stoli’s parent company) to donate $5 for each person whom RSVP’s and attends The Most Original Stoli Guy Live in San Francisco, San Diego, Dallas and D.C. The participating charities include local chapters of Equality CA, Equality Texas and the HRC, all whom will be present at the events to accept the donation. GayCities is currently in discussions with SPI to select an international beneficiary that works directly in affecting change for LGBTs in Russia. The organization will be revealed live at The Most Original Stoli Guy finale, which GayCities will stream live from NYC this September. Now I’d hope that we can see through this ploy. GayCities and Queerty want the StoliGuy events to be successful so that Stoli can make more money and in return they will also. And the charities, which aren’t even LGBT Russian or International charities are just a red herring to get people to attend, question the boycott, and hopefully not be protested again like the last StoliGuy event in NYC. But the real problem with this email is that GayCities and Queerty is lying to save Stoli. According to Micheal Cole-Schwartz of the Human Rights Campaign, the HRC is not participating in The Most Original Stoli Guy events and is not accepting any donations related to these events or otherwise from Stoli. Also Equality California has confirmed that they are not participating in any StoliGuy events. Both GayCities and Queerty should be deeply ashamed of themselves for not only keeping their sponsorship and still promoting Stoli. But also for using blatant out and out lies to try to save it and defend it. Perhaps maybe its time for some new hashtags. Boycott these and all Russian products. If Stoli were actually a Russian product I would be on board – but once again, get your facts straight. Stoli that is sold outside of Russia has nothing to do with Russia and the money doesn’t help or hurt Russia. Stop being sheep and find more productive ways to help. Stoli is made with ingedients bought in Russian and owns wheat fields in there even though it is bottled in Latvia, which by the wau isn’t that hot on LGBT rights either. Get your facts straight and stop falling for corporate spin. The Russians are violating the human rights of their people. It is completely wrong but I feel this boycott is misguided and lazy. We have gay men getting arrested in Louisiana right now. Before we turn our anger toward a foreign country we should look at home. And not buying something is probably the laziest form of activism anybody can practice. By the way, there are many other counties that actually imprisone and some even execute LGBT citizens. Saudi Arabia might be one we might boycott. But wait..we need their oil right? This boycott of Stolichnaya is completely misguided and it has been from the start. without them, as they were one of the critical original backers.They spent money directly out of their own pocket to fund a documentary series about the LGBT community. thing is actually pro-Russian, not anti-Russian. Once again. REGARDLESS that it is bottled in Latvia it buys its ingredients and owns wheat fields in Russia, thus boosting Russia’s economy and supporting its Government. You buy a bottle of Stoli here in the USA, profits go to buying more ingredients in Russia. It’s sad that the pre written email was sent out while they were working with the charities to be involved which didn’t transpire… they have since solidified charities more than happy to take the donations, as they understand that Stoli is NOT a Russian product. I love how they didn’t post the retraction and correction email sent out shortly thereafter…. I am all for boycotting Russian products, too bad Stoli isn’t one of them. What offends me most here is the misuse of “in lieu of” (he meant “in light of”) and not one but two misuses of “whom” (in both cases it should be “who”). How Mr. Raymundo became a communications professional is an Absolut (hee) mystery.